News from LMCU: Is a CD still right for you? Consider your options. Is a CD still right for you? Consider your options. In today’s tax environment and long period of flat interest rates, CDs are no longer delivering the kinds of returns we became accustomed to. Certainly, they’re still among the safest investment options available, but your money can easily be working harder for you. If you have a CD that’s approaching its maturity date, contact Lake Michigan Investment Services to explore more fruitful income-generating possibilities. You can depend on objective, unbiased advice from some of Michigan’s most skilled investment pros. Whether your maturing CD is intended as a wealth-building, retirement or savings vehicle, the time is now to consider options that still provide investment security while delivering higher rates of return. Just because a CD might have been right for you in the past doesn’t mean it still is. 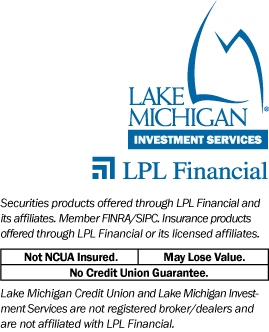 Contact Lake Michigan Investment Services today at (616) 234-6524 for more information or to schedule a free investment portfolio review with an LPL Financial Advisor near you, or go online to lmcu.org/investments to set up an appointment.